Grit hissed and clattered off the hood of the small skimmer as it ploughed through billowing red clouds of oxide dust. The tandem craft buffeted like a leaf in a storm, jinking and swerving through a mangled sprawl of skeletal buildings and ducts. Welcome back reader. This week we have a miniature I started in 2015 but only finished recently (some of our long-standing Instagram follower may even recognise it!). 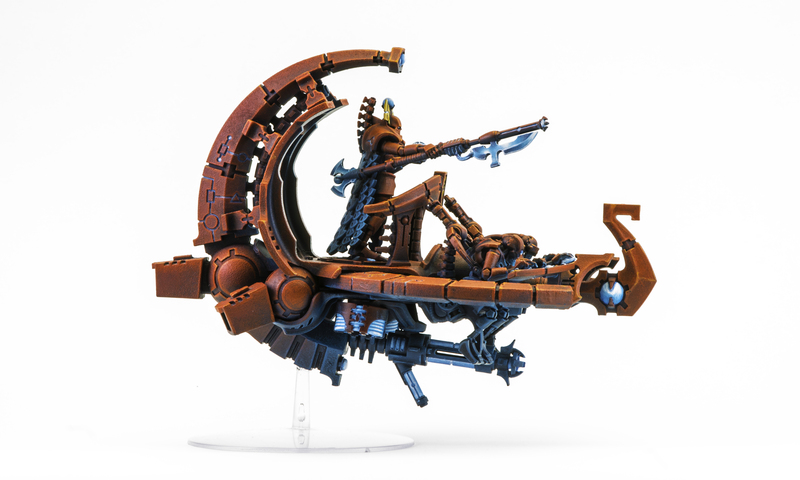 It is, of course, the beautiful T’au Pathfinder Tetra. Sickly shafts of sunlight pierced the vaults of the derelict Sector. Dwarfed by towering stanchions and silos, a band of tiny figures stalked furtively amidst the shadows. Through a haze of incense and the voltaic crackle of the noosphere, Metallica’s cyborgs march to war! Here we stand on the brink of a golden dawn. In a universe of ancient tyrants, the destiny of our birthright burns unstoppably like a newborn sun. Illuminated by the Greater Good we shall blaze a shining path through the darkness. Mindlessly driven by deconstruction protocols, the chittering swarm of Canoptek Scarabs decends on its prey in a horrific multitude of monomolecular razor-claws and particle cutters. Rendered down to its very elements and its atomic energy harvested, no trace of their prey is left behind when the swarm ascends. 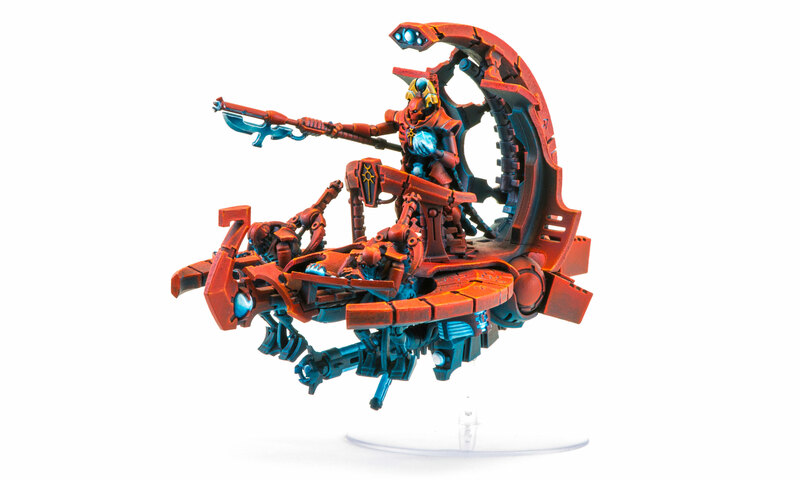 The third installment of our Necrons of the Derelict Planet arrives today, ready to atomically flense your pathetic organ-bodies and short-circuit your primitive computer-comms arrays! 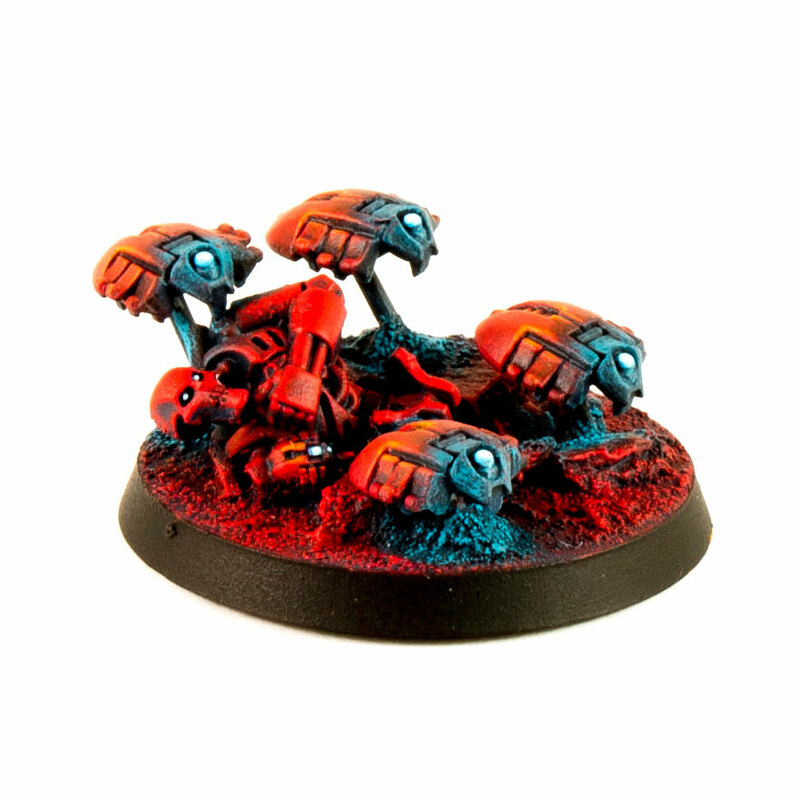 Our Canoptek Scarabs hover above an oxidised wasteland, illuminating the debris of the battlefield with the blue glow of their anti-grav repulsion fields. 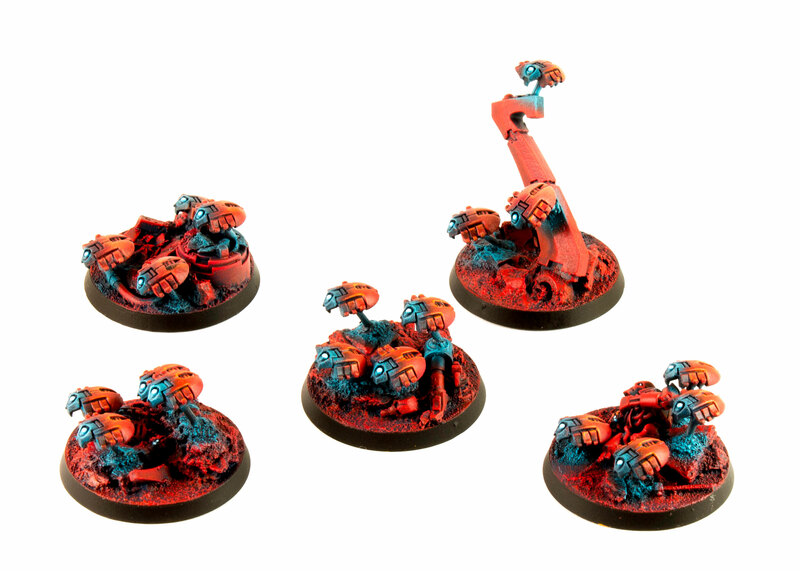 Amongst the debris are the radiation-blasted remnants of Necrontyr structures and warmachines. The derelict exoskeleton of a Necron Warrior languishes on one of the bases. Its ocular circuits flicker as reanimation protocols are rebooted by the galvanising energy fields of the nearby Scarabs. We wanted to add some dioramic elements to these miniatures. 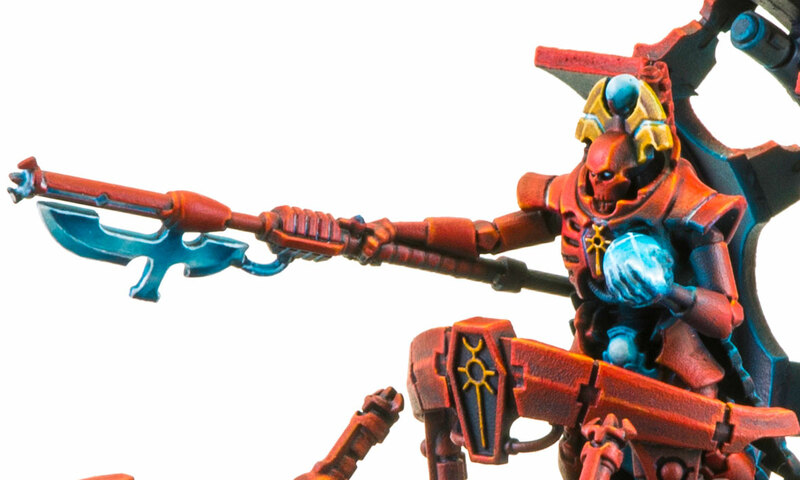 As part of the rather venerable Necron Warrior kit, Scarabs can look a bit plain and boring compared to newer miniatures if just clumped together on a round base. 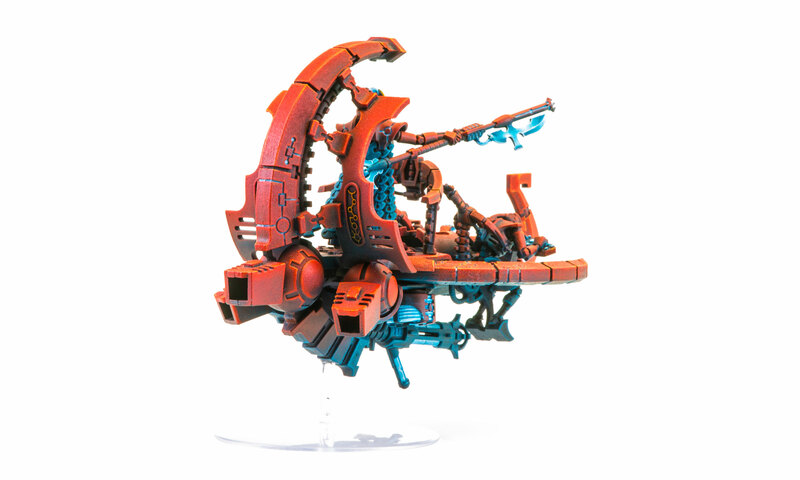 If you’re interested you can see the Necron Warriors and Catacomb Command Barge for this army and some info on how we came up with the colour scheme. 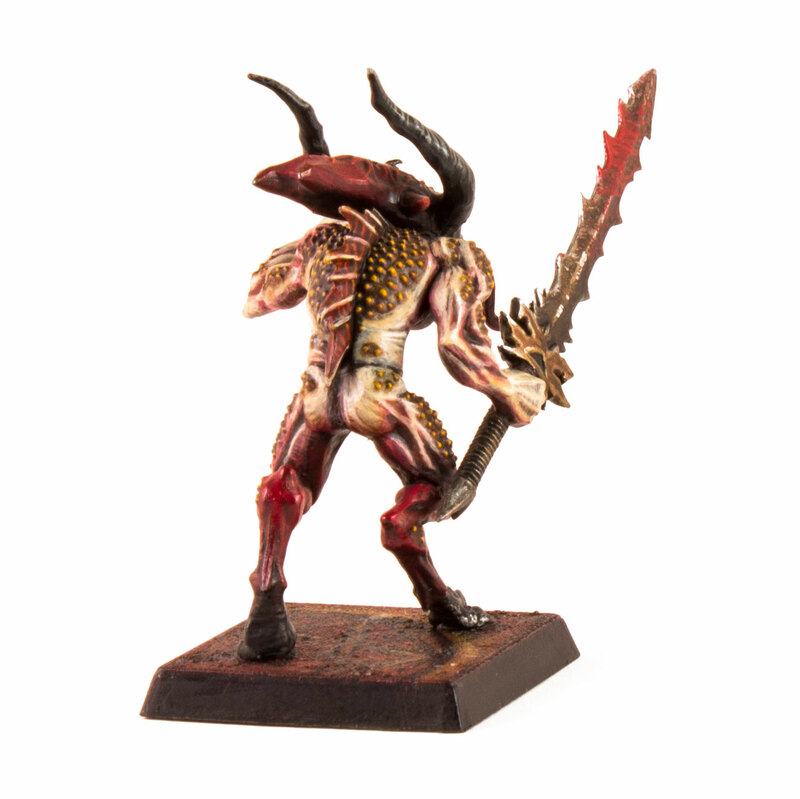 Enticed from the empyrean by the tang of sacrificial blood, a lesser daemon of Khorne manifests into the material realm. 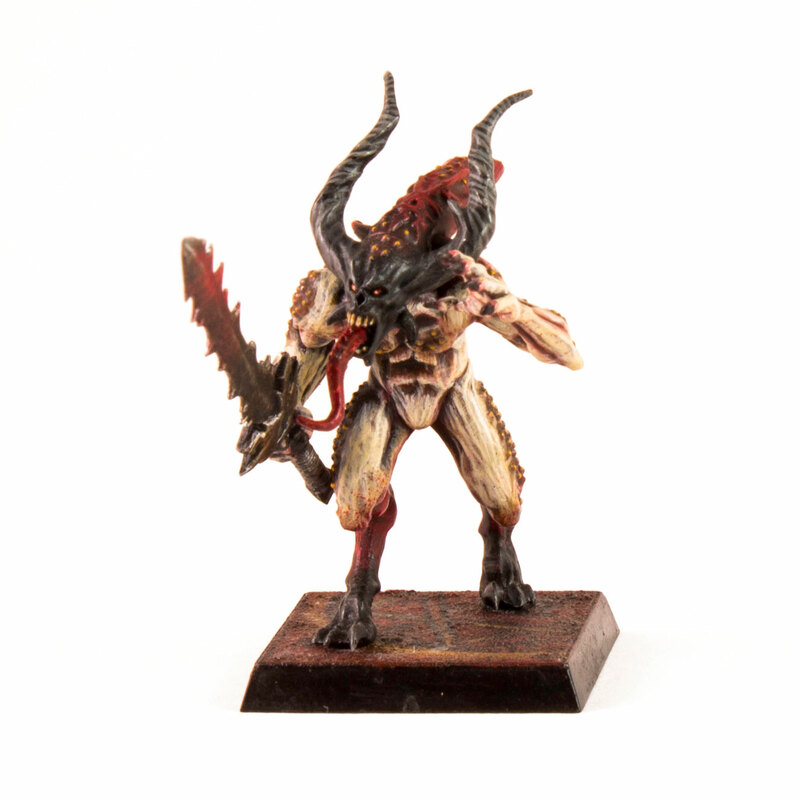 Khorne has been getting a lot of love recently, so to honour the Blood God today we present one of his minions. This is a bit of a throw back to a mini that was painted a few years ago. This guy is the first of many models painted in a ‘Blanchitsu’ style, and ultimately spawned an entire army of Vampire Counts painted in this way! In the same way as the Cairn Wraith that we featured a few weeks ago, the colours on the Bloodletter were built up from a dark crimson basecoat. Highlights were added with drybrushing and glazes of off-white and bone to emulate the style of John Blanche’s concept art. The scales were picked out in Vallejo Model Scrofulous Brown . The hellblade was dulled down with several glazes of brown and sepia paints and some Devlan Mud wash. I then went back to pick out the sharp edges with Mithril Silver. It was good fun to tackle a Khorne model that isn’t just blood red! They have a really creepy, almost alien feel to them, that I just love. 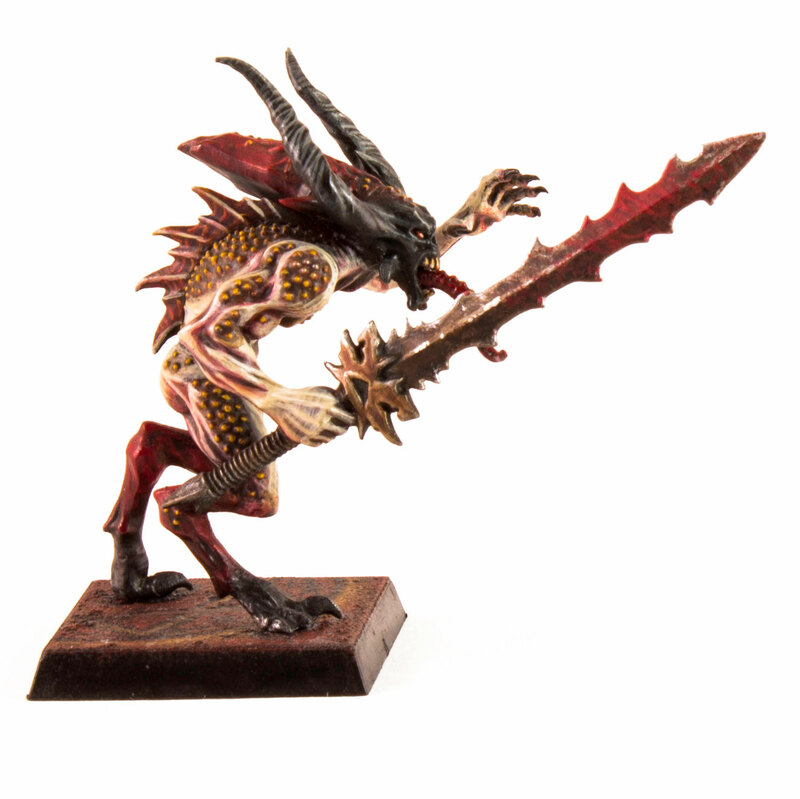 At some point we’d like to work on a Khorne Goretide army for Age of Sigmar – the new models are simply fantastic. Manical from an eternity of stasis-slumber, the Phaeron of a long-forgotten dynasty rides to war. Behind him, vast and implacable hordes of machine-vassals march in unison. Once again the galaxy will face the wrath of the Necrontyr! 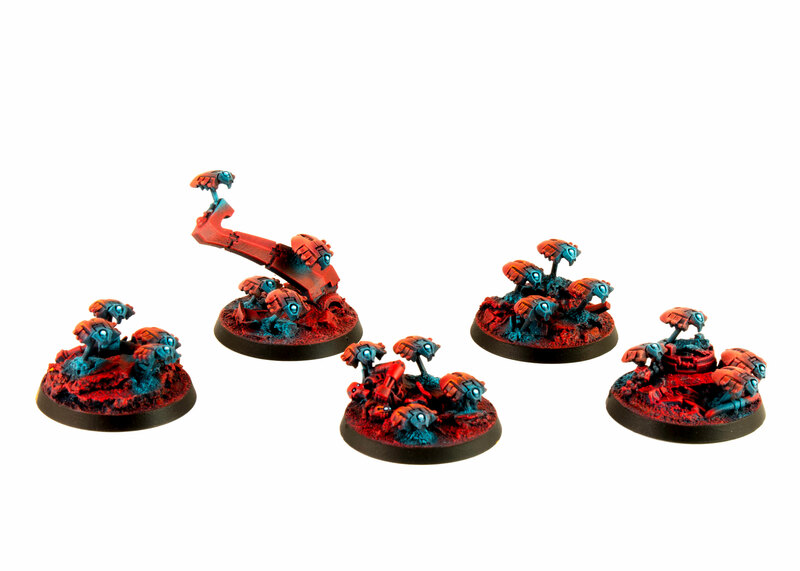 Time for the second installment of our collaborative project – The Necrons of the Derelict Planet – inspired by the fantastic artwork of Pascal Blanché! 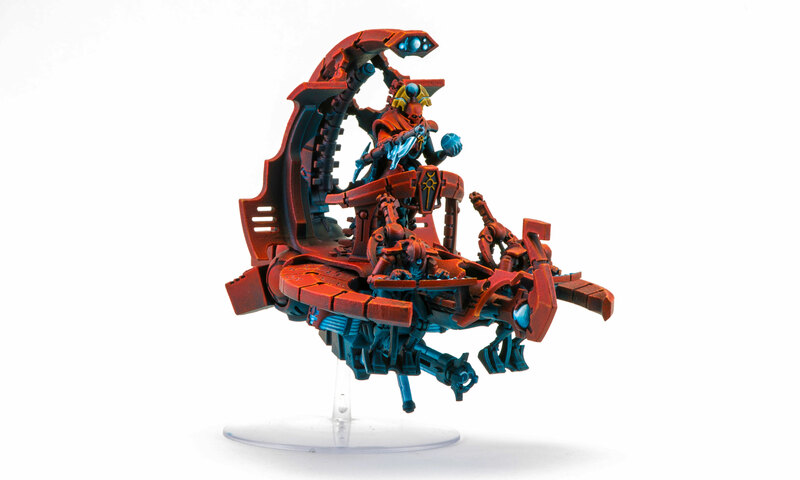 It’s back to 40K this week as we present the superb Necron Catacomb Command Barge. If you’re into vehicles then this is a real joy to paint. It has organic curves – perfect for fades and blends – as well as crisp edges for sharp highlighting. 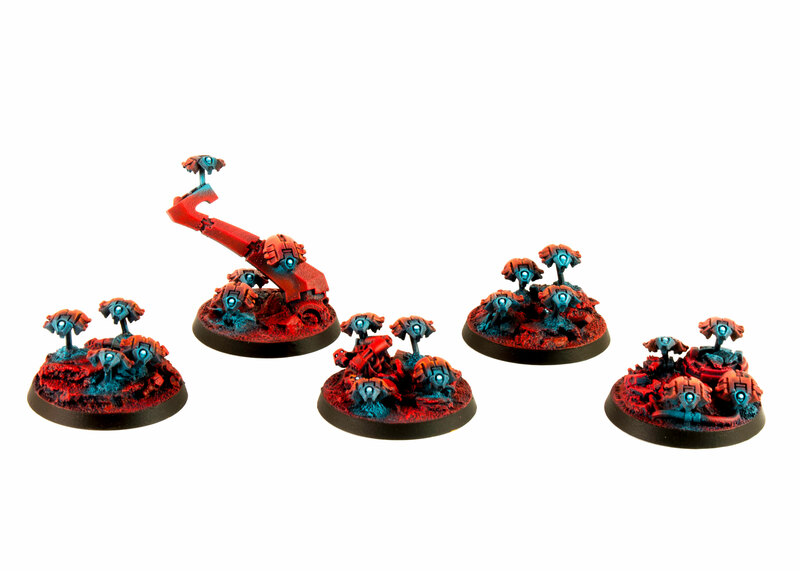 As with the Necron Warriors we painted the Command Barge together over a few sittings. The colours are intense and vibrant, built up in successive layers initially using sponge and drybrush, with more controlled glazes and edge highlights deployed towards the end. The Necron Phaeron was a perfect opportunity to try out some advanced painting techniques. 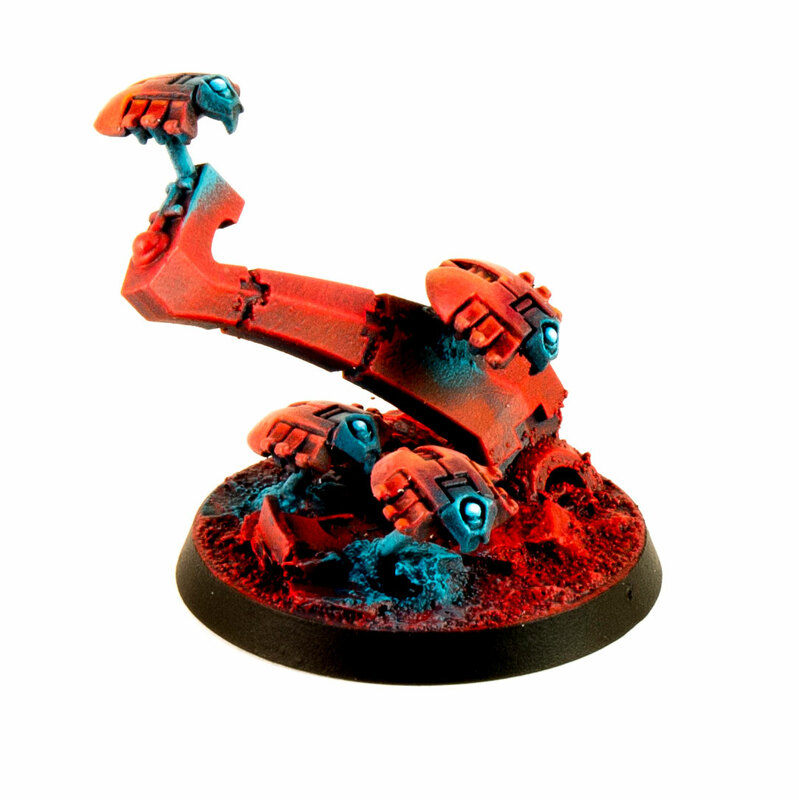 His War-Scythe and Ressurection Orb were embellished with glowing blue non-metallic metal effects. We’re pretty happy with how they turned out. We used the iPhone app Snapseed to work out how to light the War-Scythe before painting it, to ensure the lighting looked correct. We’ll feature this in a future blog, but here are some close ups. As ever we’d love to know what you think of our work, your feedback sustains us! Also, we’d like to thank Pascal for tweeting our blog last time – great to have some engagement from such an inspirational guy! We highly recommend you check out Pascal Blanché’s art on his blog or excellent art book Derelict Planet.